Wills Eye Hospital Clinical Researchers found that the best way to find, diagnose and treat patients with undiagnosed glaucoma was to reach them in the primary care setting by partnering with local physicians. In a sweeping city-wide study over the course of a year and a half, Wills Eye Hospital Clinical Researchers found that the best way to find, diagnose and treat patients with undiagnosed glaucoma was to reach them in the primary care setting by partnering with local physicians. Glaucoma is an eye disease that can damage the eye’s optic nerve and result in vision loss and blindness. It can develop in one or both eyes and often causes no pain. Vision appears to stay normal, although over time it can deteriorate. However, with early detection and treatment, you can often protect your eyes against serious vision loss. Anyone can develop glaucoma. Blindness from glaucoma is six to eight times more common in African Americans than Caucasians. Jonathan Myers, M.D., co-director of the Glaucoma Service at Wills Eye Hospital and study investigator, said, “The data confirmed that targeting high-risk populations identified people with potentially blinding conditions. Additionally, by working in our primary care colleagues’ offices, we had the opportunity to reach people in these underserved communities. We feel that this is an outstanding model for other cities throughout the country to use in order to help prevent blindness and, in some cases, improve vision for an at-risk population,” Myers added. The data shows 24 percent of nearly 1,000 patients screened had undetected glaucoma-related diagnoses and an additional 21 percent of diabetics had retinopathy, which is also potentially blinding if left untreated. The study, funded by a federal grant from the Centers for Disease Control and Prevention and headed by Lisa Hark, Ph.D., RD, and L. Jay Katz, M.D., included a mobile vision screening team. The technicians went out to health centers and primary care offices reaching out to patients who were there for a variety of other health reasons. The vision exams and imaging were then evaluated at Wills Eye Hospital and patients diagnosed with eye problems were connected to a local ophthalmologist. Myers will be presenting his findings at the upcoming American Glaucoma Society Conference in New York City, March 1-3, 2018. The Wills Eye Hospital Glaucoma Department has 15 research studies being presented at the conference. Researchers will be reporting on outcomes for the latest diagnosis and treatment techniques. Myers, Katz and Hark are available for interviews. Wills Eye Hospital is a global leader in ophthalmology, established in 1832 as the nation’s first hospital specializing in eye care. U.S. News & World Report consistently ranks Wills Eye as one of America’s top ophthalmology centers since the survey began. 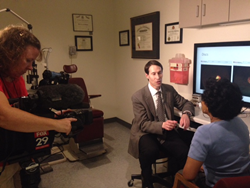 Wills Eye has the most nationally ranked ophthalmologists in the country. It is a premier training site for all levels of medical education and its resident and post-graduate training programs are among the most competitive in the country. Wills provides the full range of primary and subspecialty eye care for improving and preserving sight, including cataract, cornea, retina, emergency care, glaucoma, neuro-ophthalmology, ocular oncology, oculoplastics, pathology, pediatric ophthalmology and ocular genetics, and refractive surgery. Ocular Services include the Wills Laser Correction Center, Low Vision Service and Diagnostic Center. Its 24/7 Emergency Service is the only one of its kind in the region. Wills Eye also has a network of nine multi-specialty, ambulatory surgery centers throughout the tristate area. To learn more, please visit WillsEye.org.